Shopping for dad is not an easy task. People all over, every year, find themselves deciding between more aftershave and a tie. Ontario Bakery has celebrated so many Father's Days with different families over the years and we've learned a few things that might take some of the pressure off the decision making. Take it easy and create a day he won't forget. 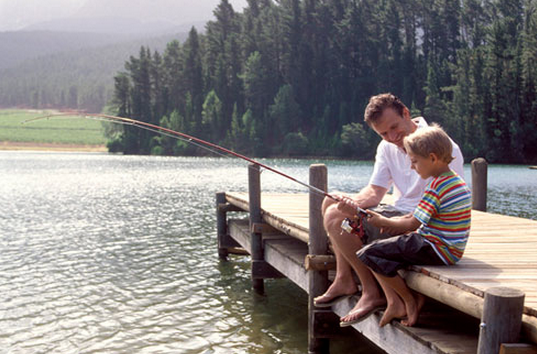 Here are 8 ways to celebrate Father's Day that Every Dad will love! You know that favorite restaurant he always talks about? Take him! It's a no brainer. This still ranks as an all-time favorite, perhaps because it’s an easy option and many dads look forward to this tradition. (make sure to include desert! Most men (dad's) love music of some sort. Take him to see one of his favorite bands or singers. Or even better, look for a concert in the park. Many areas are offering them already and it's a great place to relax and enjoy the day together. Give dad the day off. Many dads prefer to spend Father’s Day with their kids and family but some dads (especially newer dads) may enjoy taking a breather to recharge the batteries. Make dad feel special and making him a three-course (or five-course!) breakfast. Most people tend to eat this meal on the run most workdays so a Father’s Day breakfast with all of dad’s favorite breakfast foods is sure to make an impression. Take him out to a sports game! Why not turn the tables around and take him out. Watching a baseball game together is a great way to spend an afternoon. An old dependable past time like this is almost always a winner. (Unless they're a vegetarian, then you may want to consider going to a u-pick fruit farm!) A leisurely Sunday afternoon hanging out with dad at the local lake, river or beach may be just what your dad needs. Gift cards are still a popular gift option but you can personalize your gift by making something for your dad. It could be something as simple as framing a favorite picture of the two of you (or dad with all the kids), or something more involved if you are the crafty type. This year, give dad the gift that speaks to his heart! And if you're looking for custom baked cakes, personalized treats or even some freshly made cookies, Ontario Bakery is your one stop shop! Happy Father's Day!